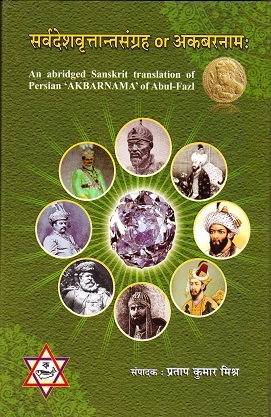 To present the importance of this work in brief, three facts would be enough - First: This is the Sanskrit translation of Persian ‘Akbar-Nama’ and can be frame as the second work (Sanskrit Translation from Persian) in the known history of Sanskrit literature. Second: the great Mughal emperor Akbar was the person who assisted and promoted this translation, and Third: Mahesh Thakur; a great Maithil scholar, the present Sanskrit translator of Persian ‘Akbar-Namah’ had obtained kingship over Mithila from Akbar as a gift for his academic contributions, as well as translation works in the royal court. After him the descendent of Mahesh Thakur, called “Khandbala-Dynasty” ruled over Mithila till 1947 A.D.
A hand-written copy of this work was observed between 1796-1821 A. D. in the ‘DACAN’ by Colin Mackkenzie. As soon, the learned man transcribed a copy for own. Colin Mackkenzie returned to London in 1819 A. D. with his own library wherein the present work was preserved. In 1821 A. D., Mackkenzie passed away and his library was donated to the ‘London Commonwealth Relation Library’ in 1833 A. D. wherein this work was registered on 3rd December-1833. Theodor Aufrecht, a famous scholar of Sanskrit Studies, has taken some notices from aforesaid work in 1872 and published information about this in 1877 into his ‘Catalogues Catologorum’. After receiving the information about it from Aufrecht, His Highness Sir Rameshwar Singh, King of Darbhanga-Raj, brought a microfilm of this work from London about 1900-1910 A. D. but he failed to publish the work. In 1922 this work was sketched out in 20 lines by famous Hindi-story writer Pandit Chandradhar Sharma ‘Guleri’ in a renowned Hindi Annals. His Highness Sir Kameshwar Singh, son of Rameshwar Singh, the King of Darbhanga-Raj, forced the Pandits of Mithila to edit and publish the work while his father was unsuccessful in the task. In this regard the famous Indologist Sir Ganganath Jha had taken the task during 1922-1935, but the task was not completed due to unknown reasons. After him, Dr. Amarnath Jha, an erudite son of Ganganath Jha has also been taken the charge but the task was not finished till 1960. Dr. Subhadra Jha, a well-known scholar of Sanskrit from Mithila, was able to publish the dream-work of aforesaid Kings and scholars, but unlucky as he was, the published copies were destroyed due to an unfortunate fire accident in the Patna University press. From 1962 to 2012 A.D., no publishers of Sanskrit of India or abroad have taken the initiative for this work. When we ware working on ‘Akbar aur Sanskrit we came across this work and decided to publish the book any-how. The text which is published here is based on the Subhadra Jha’s edition which is preserved in the “Kalyani Bhavan Library” at Darbhanga. The corrections in Jha’s edition are furnished and a critical text has been presented for the curious reader. The “Preface” is most important in the book wherein many Historical, Lingual, Literal and Indological concepts of the work has been discussed in extent. We hope the publication will make very happy to Scholars of the Indian History and Sanskrit Literature.